Although most Millennials have not had the luxury to experience such adventures in sugar-land past times as did our parents and grandparents, a small company started in 1895 sure has an incredible fix that is still available today. 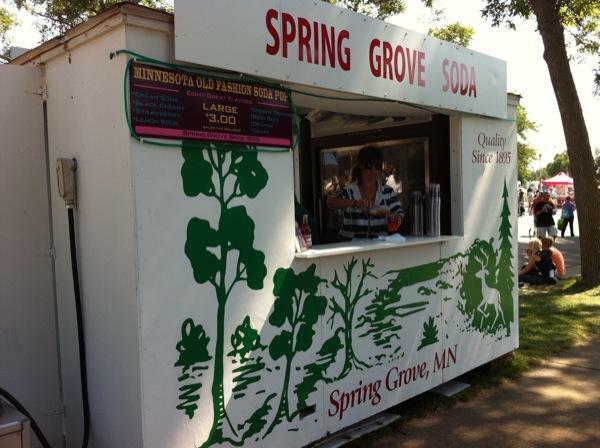 Spring Grove Soda of Spring Grove, Minnesota has been making fountain shop quality sodas for over a hundred years. They still use basically the same formula that they did when they opened their doors. The taste is so fresh and pure and without any artificial qualities that large cola production companies can tend to have. Spring Grove uses pure cane sugar and water for all eight of their delicious flavors. Their current distribution is about 100 miles radius of their hometown in SE Minnesota. I can honestly say that this is the best soda that I have ever tasted. Period. Originally, I found the Lemon Sour flavor at Heartland Market in Saint Paul and it was the perfect thirst-quenching answer to my hot day at the farmers' market a few months ago (Heartland carries goods all year, so you can pick up a bottle after the fair is over). Yesterday, while in search of a non-alcoholic beverage, to say I was pleased to find the green and white soda booth while strolling the fair grounds is an understatement. Instantly I went over to snag a Black Cherry. It was not only as good as I remembered, but better! It was not long until I returned for a second helping of the wonderful Lemon Sour bubbly. 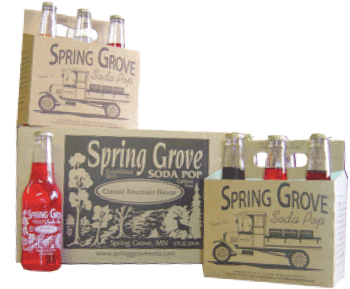 Spring Grove Soda has their doors open to the public for tours and a bottle shop for take-home supplies. Check them out this fall for their Haunted Pop Factory in the month of October! Rachel Huntzicker is a writer, practitioner of yoga and clean foodie with an evolving desire to learn more about sustainable whole living and the food-to-mood connection. From her evolving and ever present desire to learn, she came to conclusion that growing her own quarter acre organic garden was a must. Follow her journey on her blog, the Woodland Garden. Soda photo courtesy of Spring Grove Soda Pop Inc.